For those of you that like the idea of trying Melonheads for a first haircut, the Styles & Smiles 4 Kids salon in Pickering has similar features without the high price. This salon location was previously the Little Tots Hair Shop which had been in the area for over 20 years, specializing in kids cuts. Since Little Tots chose not to renew their lease for this location, some of the stylists that previously worked with them have taken over the lease and are re-opening as a new business – Styles & Smiles 4 Kids. I visited the salon while it was undergoing renovation and their look is more modern than what you may have seen before if you visited this location in the past. From my experience trying different salons in the area, what stands out about this one is how clean and fresh it feels. The salon is colourful, yet modern. And similar to Melonheads, little ones can sit in themed chairs while they get their haircuts. There’s also lots of toys available in the waiting area for kids waiting their turn – there’s a foam mat play area stocked with toys and a new ball room (ball pit) to be installed. This setup is perfect if you have to bring along an older child for your baby’s first haircut. Operating in the location that was previously the Little Tots Hair Shop – Styles & Smiles 4 Kids is owned by a group of stylists who previously worked at Little Tots. Despite not knowing the long history of this salon, the expertise of the staff shows from watching them work with the other children that come in. When I visited I met Sofi, one of the new owners of Styles & Smiles, while she was talking to a six year old about having his haircut. He was scared and didn’t feel like trying a haircut today. I watched as Sofi talked with him to explain what would happen and made sure that was what he wanted. The little boy left and Sofi let him know she would be there when he was ready. No pressure at all! I was impressed. Which brings me to my next point – It’s best to walk in for an appointment. I only waited less than five minutes because the child that came in at the same time as me decided not to go ahead with their cut. It’s really depends on the day, so come at a time when you know your little one is fed and rested. 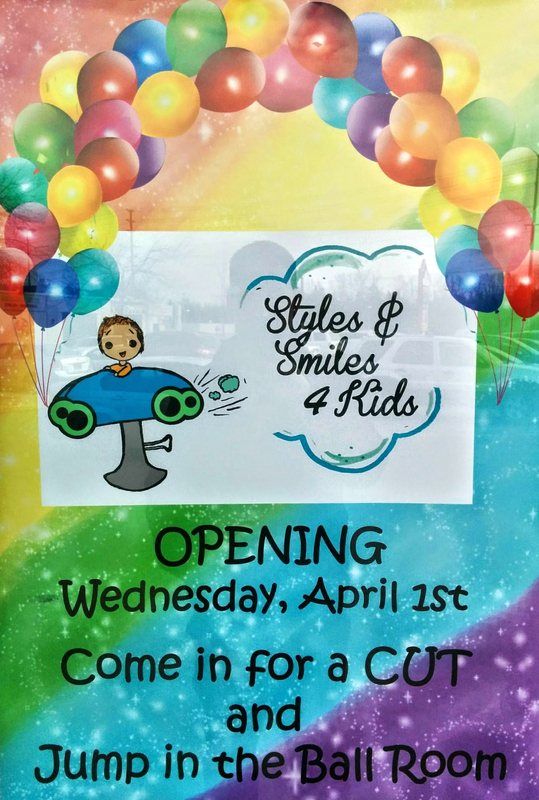 This Wednesday, April 1st, Styles and Smiles 4 Kids (1725 Kingston Rd, Pickering) will be hosting their grand opening. Their salon is open 10am-6pm weekdays, 9am-5pm Saturday and 11am-5pm Sunday. Cost: Kids cuts start at $16 (+ tax and tip). I am dissapointed to see this posted on Motherhood Scene . This Salon use to be Little Tots – a kids salon that I have taken my 12 year old to since she was 2. After reading your article I figured they had re-branded and a new owner was brought on board. This is not the case, I was in contact with Little Tot’s Queen St. location in Toronto and they advised me that they are not affiliated with this new salon in any way. Parents beware – as this acticle is misleading. Hmmm Laurie, can you quote exactly where is the author saying that this new place is affiliated with Little Tots??? Parents beware as this comment is clearly misleading due to a lack of reading comprehension. Please go back to school. Ana: I generally do not stoop to the level of someone who is as eager as you are to insult someone — however I will provide you with clarification. You are right the author did say ” THE SALON was PREVIOUSLY Little tots”. –	This is misleading as Smilz/Stylz was NOT previously Little Tots. –	The way the article is written implies that a re-branding was done or the company changed its name. This is not the case. –	This also implies it is the same company —- How can Sofi be a LONG TIME STAFF MEMBER if the company, Smilz/Stylz just opened ???? Hopefully that will clarify things for you, Ana. If not and you choose to write another, low blow comment – I will choose not to respond. Blogs like this, that are useful to mothers like myself do not need to be plagued by rude comments between parents who hide behind their screens acting like children. The intention of my first comment was to clarify information for parents so that they can make an informed decision for their family. ……. Did you even click on the link provided? I’m glad you are not planning on replying because you are making yourself a favour since you keep showing your poor reading comprehension skills. Advice: READ THE ENTIRE SENTENCE, and click on the links…. The intention of my comment is to clarify parents from YOUR misguided information just because you can’t read properly just yet. Again… Go back to school. Ladies, I’m very appreciative of the time you’ve both taken to respond to my post here. I’m always flattered to hear from my readers with any feedback as it’s my goal to deliver the best content possible. Feedback is always welcome for the purpose of helping other readers. Any comments that fall outside of this definition will not be supported or endorsed by this blog. Personal attacks are simply not in the spirit of what The Motherhood Scene stands for. I will be editing my original post to clarify the point about salon ownership. I could not agree more Leshannem. I was shocked to see a parent insult another parent so aggressively. Thank you for taking the time to update/ edit the post. Great review, looking forward to the new look. I’ve been taking my kids there for years, I’m really glad Sofi is still there as well as Sue and Pearl. Not sure about any management or ownership changes but as long as the staff is the same I’m happy! It seems like the new owners are putting some effort into making the store more modern and fresh which I think is great!